changed 300 files with 22320 additions and 11858 deletions. It is, and its available for developers to use right now! -- This code can be pasted into the command bar, but only once. It is also available in Roblox’s new Toolbox. You can right click on an item in the toolbox to view it in a web browser, or copy its AssetId. Really happy with this update. I can make reactions to my own posts… right? PSA: You can copy a decal's AssetId directly from studio's toolbox now! I just don’t see why it’s RobloxScriptSecurity. They could make it a prompt like “This plugin would like to copy this string. Allow?”, and even the same for GetClipboard. They could make a prompt where it confirms the action. I’m sticking with SourceSans, heh. To me Gotham is feels squashed, like the retro font but less extreme. Still good to see them adding more fonts, though. 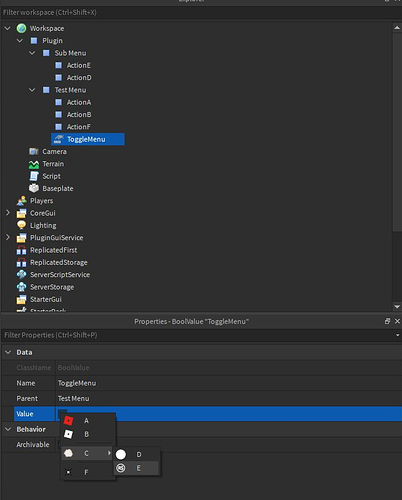 My theory right now is that it was added without going through the standard API approval procedure, rather it was just something they needed to add quickly for one of their use cases (such as the right click menu’s “copy asset id” option in the toolbox). It may be opened up to PluginSecurity later down the road, as long as it’s verified to be safe for general purpose use. When I try to use the new PluginMenu instance inside of my plugin, after the plugins refresh when updating, the menu stops working. Any idea why? I know that the Toolbox is able to get past this problem. I’m hoping you know the answer to this problem since you’ve looked into them before. Not sure, it could be a bug. If you are creating the menu initially and reusing it, there may be some unexpected behavior there. 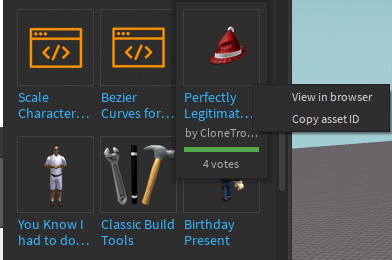 Roblox’s Toolbox only creates the right-click menu when the right-click action happens, so maybe try creating the menu in a scope where its activated so it can be recycled without issues. If that doesn’t work, try assigning unique ActionIds everytime you spawn a menu.